Aquathlon is a martial art and combat sport in the water and under the water. The origins of the name, 'Aquathlon' are 'Aqua' - water and 'Athlon' - wrestling. The object of Aquathlon is wrestling between two wrestlers wearing masks, fins, ankle bands and ribbons. They wrestle under the water and on the surface in order to tear off their opponent's ribbon from one of his ankle bands. 1980 - 82 Igor Ostrovsky, a coach of underwater sports at the Moscow Technological Institute, created and developed Aquathlon. On the 8th of April 1982, the first Aquathlon competition was held in Moscow. 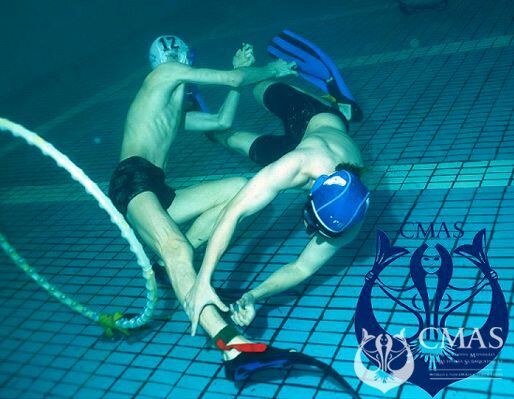 In 2008, Aquathlon was recognised by CMAS (World Underwater Federation) as a sport discipline. In 2009, the Aquathlon Commission was established in the CMAS Sport Committee.